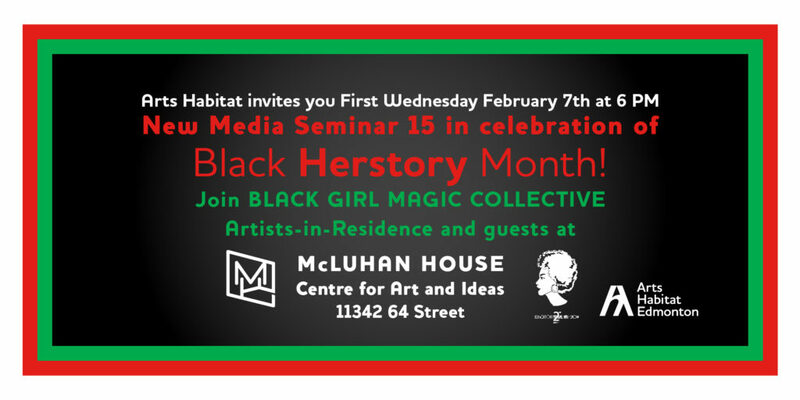 McLuhan House Artists-in-residence, Black Girl Magic Collective is hosting a discussion on the experience of black people living in Canada, particularly, Alberta and their experiences around their hair. We will be hearing from barbers to hairdressers to community organizers on the history of black hair care, the challenges in finding resources, self-perceptions, misconceptions, and transferring knowledge to the next generation. Turn out. Tune up. Drop in! Please R.S.V.P.. Seating is limited. Suggested donation of $5. Admission is paid at the door or through Eventbrite. Light refreshments provided. Join the social and cultural community of McLuhan House. Meet artists, researchers, and local residents who are continuing Marshall McLuhan’s legacy of probing new media in the global village! First Wednesday offers opportunities to engage on different topics of importance to our future at the intersection of social history, art, communications, and technology. In January 2016, McLuhan House opened as an interpretive space for Marshall McLuhan’s life and legacy. It was designated a municipal historic resource and restored by Arts Habitat, with support from the City of Edmonton and Edmonton Arts Council. McLuhan was a famous Canadian professor, media critic and author who lived in Edmonton at the historic 1912 McLuhan Residence until 1915. Arts Habitat acknowledges that McLuhan House is situated on the land of Treaty 6 territory, a traditional meeting ground, travelling route and home to many Aboriginal peoples. We honour the Cree, Blackfoot, Nakoda, Iroquois, Dene, Chipewyan/Ojibway/Saulteaux/Anishinaabe, Tsuu T’ina, Inuit, Metis and many others whose languages, cultures, and practical relationships to the land create a rich heritage for our learning and our life in the community of Edmonton, an area also known in the Cree language as amiskwaciwâskahikan (Beaver Hills House) or pehonan (meeting place). Please note, the historic house is not wheelchair accessible. Seminar discussions may be recorded for archival purposes. Attendees and guardians of participants under 18 will be requested to sign an image and audio release form. We honour everyone’s right to actively participate in the discussion and endeavour to create a place for wide representation across discipline, class, gender, race, sexual orientation, age and ability. Oppressive language or behaviour will not be tolerated. Play, Doodle, Draw, Have Fun! Listen together for patterns, insights, and deeper connections. Space is limited. Please reserve your seat on Eventbrite. Thanks in advance for spreading the word on Facebook!